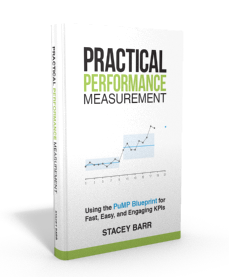 There are all kinds of reasons why so many organisations have performance reports that are bursting at the seams with measures that mean nothing, impact nothing or lead to nothing. They’re measures that some will say “that’s interesting” and others will bark are “a waste of time”. Often it’s because they are the measures that have always been reported, or some manager once wanted the measure for a project that ended five and a half years ago but it’s still being report just in case, or because something is better than the nothing that would exist if we left it up to decision makers to decide what should be in the reports. Irrespective of why, this is for certain: if a measure is not informing a decision or choice, it’s wasting space and time and most certainly money. But how do you start the move from measuring what’s easy to measuring what matters? Start asking report users which measures or pages they always look at first, and why. Chances are their attention will go to what matters most, first. Similarly, ask report users which measures they virtually never look at or never use to inform their decision making. Listen out for whether they use the word “interesting” versus “useful”! Start dropping out the measures that report users rarely use or say are just interesting. Don’t ask their permission if you don’t have to, as their reactions will tell you if the measures need to be there. Often people don’t notice or miss what they don’t value. Ask report users what decisions they use the report to inform or assist with. I’ll bet it’s a question they’ve never asked themselves and your giving them the opportunity to become conscious of that may just help them get clearer about what information they do need.